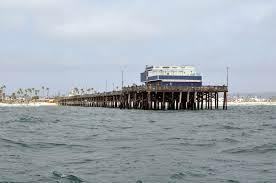 A new restaurant could be coming to the Newport Beach Pier. According to the Orange County Register, at least one company has shown interest in opening a restaurant and filling the building at the end of the pier that has been shuttered since 2012. Bluewater Grill, which features a chain of seafood restaurants in Southern California and Phoenix, appears to be the main candidate to take over the building. A representative for the company told the Register the plan is to turn the abandoned eatery into “an iconic destination” that will draw more people to the pier. The building at the end of the Newport Beach Pier has been vacant since Newport Pier Grill and Sushi Bar closed its doors after years at the site. There have been several ideas bandied about in recent months about what to do with the vacant building. This includes turning it into a place to hold art exhibits and other cultural events, to even having it host food truck fare. It is estimated the building needs $400,000 in repairs before a tenant can move in. A Bluewater Grill is apparently a favored option among the city council. One member noted how BlueWater Grill successfully refurbished a formerly run-down restaurant site in Avalon to much success. This sounds like a great addition to Newport Beach, but it will be until at least next month before any final decision is made.